At MB&F, the headliner of Baselworld 2016 is the otherworldly luminescent technology of Black Badger Advanced Composites. 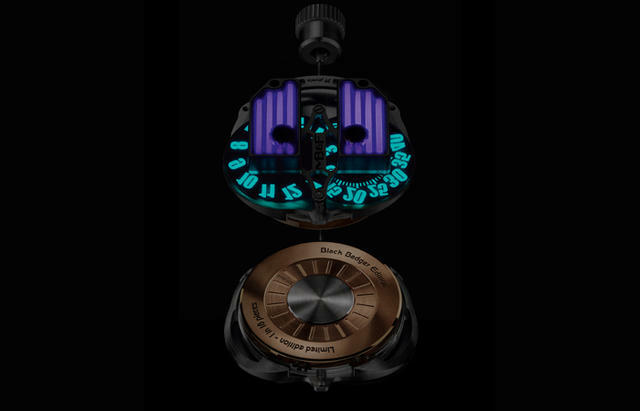 The horology brand built on Max Busser’s vision and a rotating cast of creative collaborators has added Black Badger’s James Thompson to its roster of “friends.” The result is a visually arresting evolution of 2015’s 10th anniversary MB&F HMX wristwatch. “We met at [British Watch Fair] Salon QP three years ago, and Max asked if I wanted to be involved. At first, I didn’t really know of him. After about three minutes on Google searching ‘Max Busser,’ I was sold. Honestly, an invitation to work with Max is like getting called up to the NHL from the lower leagues,” Thompson recalled. 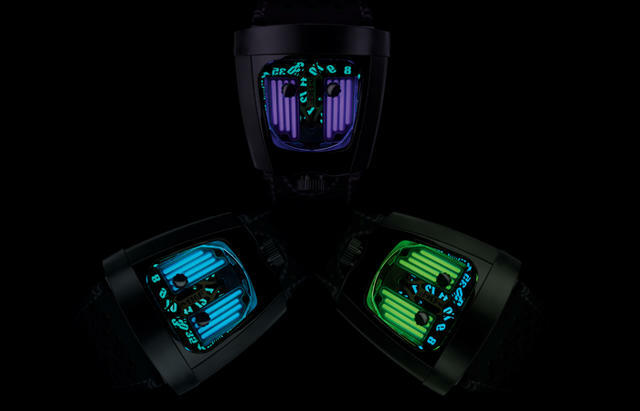 The 2016 HMX Black Badger is offered as a series of three editions of 18, each enhanced by a unique color of Thompson’s AGT ULTRA luminescent tiles. 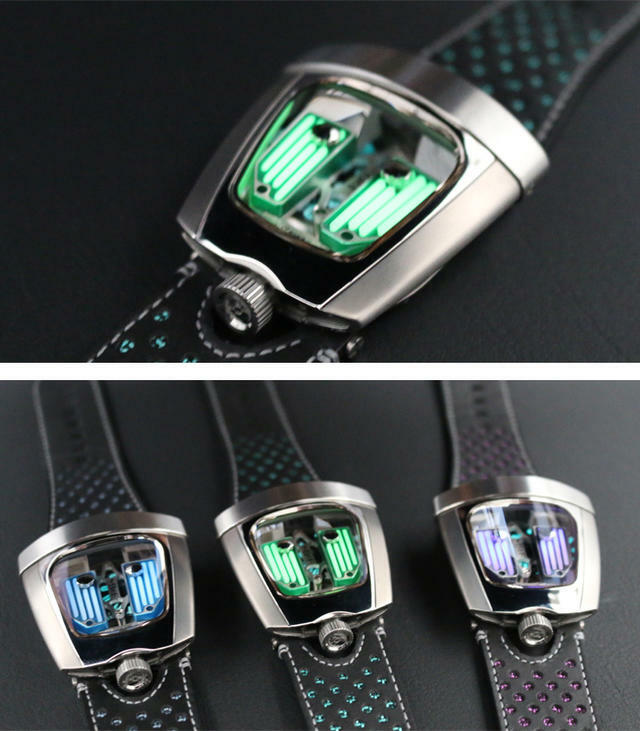 Thompson, who previously collaborated with another MB&F alumnus, Stepan Sarpaneva, for 2015’s “Korona K0 Northern Lights” series of watches, has rebooted MB&F’s HMX driver’s watch with a set of glowing movement covers. But the term “glowing” underserves the effect of the Black Badger material; this is a supernova for the wrist. Even in conventional indoor light conditions, the new HMX Black Badger’s three variants cop the look of an open nuclear reactor core. 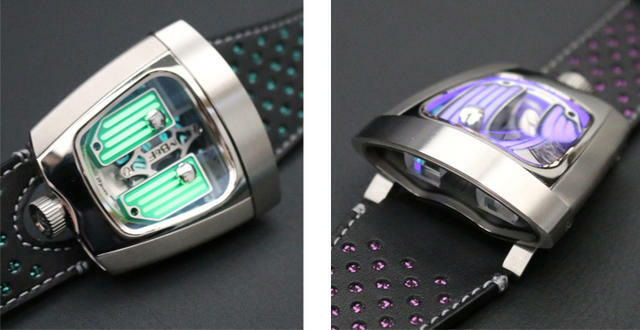 And Thompson’s nomenclature for each color is no less entertaining; buyers can select from among “Radar Green,” “Phantom Blue,” and “Purple Reign.” Each colored tile is situated beneath a sprawling sapphire canopy for maximum impact, and the matte finish of MB&F’s grade-five titanium case provides a striking contrast. “With these models, we spend up to four years planning, designing, and engineering each new Horological Machine, and then we produce them in perhaps 100 copies, and that’s it. The focus of creativity really needs to be on the next machine,” Charris noted. It’s no exaggeration. 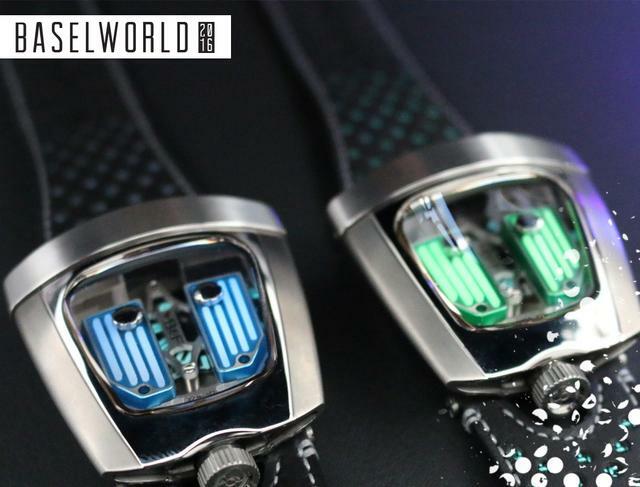 The 2015 HMX production run amounted to eighty watches spread over four color variants; the total after 2016 will amount to 134 units of all versions combined. Thompson’s contribution continues the MB&F routine of calculated contradictions. “My career has been as an outsider. I design jewelry, but I’m not a jeweler; I started working in watches on a regular basis, but I’m not a watchmaker; I’m about to announce a collaboration with an iconic automotive brand, but I’m not into cars,” Thompson observed. Regardless of the underlying logic or lack thereof, the impact of Thompson and MB&F’s collaboration is undeniable. The inclusion of AGT ULTRA to the movements caps, designed to evoke automotive cylinder head covers, dramatically enhances the salience of this core styling feature. If the original HMX design intent was a car for the wrist, the Black Badger versions are full-fledged supercars. Small details enliven the HMX Black Badger even after the initial retina-scorching shock subsides. Custom calf-skin straps with automotive-style perforation are color-keyed to the signature tone of each edition. The perforations act as a window to the colored elements beneath the top layer of black calf. Along the flanks of the case, MB&F’s jump-hour time display continues to employ conventional Super Luminova material. “We wanted to keep that element for the sake of contrast,” Charris explained. But beyond the macro and micro distinctions that define the HMX Black Badger, the core appeal of this latest Horlological Machine is the story of Thompson and his unique design sensibility. Charris describes the product progression that led to the partnership with Thompson and the HMX Black Badger. The MB&F HMX will be available immediately after Baselworld through authorized dealers at a list price of $50,000.